You may have noticed the ongoing discussions and debate surrounding the Frank Gehry project at UTS with articles by Elizabeth Farrelly, Robert Bevan and others in the mainstream press. Philip Drew adds to the debate with this thoughtful critique of the design and its appropriateness to the role of the building as a business school. The Palazzo del Tè at Mantua contains many disturbing signs of impending crisis. It is enveloped by an atmosphere of pessimism and seems on the very edge of falling apart. In a horror picture that decorates the Room of the Giants, arches crack, columns are smashed and topple over, pieces of heavy stone entablature fly through the air and in the midst of this chaos, the figures of the giants, eyes upturned, struggle to survive amidst the tumbling blocks of masonry. Elsewhere in the Hall of Eros and Psyche, Eros advances on Psyche, his prick fully extended in her direction as she pulls back. These images tell a story of crisis and violent collapse, not only is the architecture shaken, the very moral basis of society no longer holds. Everything is in turmoil. Outside, in the garden court, the framework of half columns and entablature is debased, triglyths are dislocated, rustication – boldly textured stone – is everywhere out of control and Triffid like, invades even ashlar wall surfaces as if to prefigure civilisation overwhelmed by nature. The Palazzo del Tè is enveloped by an air of nightmare. Something has gone tragically wrong -- the familiar world as people know it has been overturned and replaced by nightmare. It is a feeling that is not unfamiliar to anyone who was exposed to the coverage of the terrorist attack on the world Trade Centre in New York on 9/11. I am reminded of a night watching television late when two jet airliners slammed into the two towers of the World Trade centre, crumpling them, there was an explosion, the steel facades crumpled and began their long descent, slowly at first, then, with quickening speed, to the street below. Great clouds of grey dust filled the television screen and flooded the streets around the towers. It was macabre, for some time I sat in disbelief that it was really happening. For a time I convinced myself that it was a scene from a Hollywood catastrophe movie, then it dawned on me that it was all too real and not some fake digital illusion. It is easy to identify with the mood surrounding the Mantua palace because today, we are surrounded by a similar mood of crisis. Palazzo del Tè is almost a contemporary work in the sense that we live in a period that is similarly riven by crisis and threatened on many sides following 9/11, the Global Fiscal Crisis, an unwinnable war inAfghanistan, and the threat of Climate Change. Italy at the start of the16th century faced different troubles, Mantualost a third of its population to the plague and Spanish troops sacked Rome in 1529. One does not have to look hard to identify the causes in the change to a mood of impending crisis, uncertainty and ennui that pervades the palace atMantua. Federico Gonzaga, Duke of Mantua, was a Renaissance prince with strange tastes who was obsessed by dwarfs. His architect, Giulio Romano, was a direct pupil of Raphael. The palaces decorations were completed between 1532-34 which overlapped this period of troubles. There is something else about the architecture that connects it with the present, with, to be specific, the design for the new Business School at UTS in Sydney, by the world famous Canadian born Frank Gehry. Gehry resides in Los Angeles. This is the element of play. Just as architects tired of the architectural the language of ancient Rome, as similar style fatigue is evident in Frank Gehry respecting Modernism. Gehry plays with shapes much as Giulio Romano did with the Roman orders and details. Reactions to the Gehry design have been sharply divided, some like it while others are disturbed by it but are unable to put their finger on why they hate it with such vehemence. Germaine Greer thinks it is superior to the Sydney Opera House. Possibly it is the collapsing façade on Broadway with its tortured geometry of crazy arbitrary distorted rectangles and tangle of shapes that appear to be falling but have been arrested and frozen as in a movie which has been stopped in the middle of the action. The building looks as if it has been hit by a powerful earthquake, and like the scene in the Hall of the Giants, all hell has broken loose. It has even been likened to an abandoned termites nest. A badly eroded nest that is about to collapse. Who is right in this debate? A knowledge of Italian mannerism, will help us understand and explain the imagery used by Gehry. Much the same as Italian culture underwent a series of artistic phases after the Early Renaissance, in the 20th century, following Modernism, there have been a series of phases and changes in taste. What we get with Gehry is the latest attempt to forge a new post Modern sensibility that has many of the same markers as mannerism. Something quite different and new seems to have emerged. Vanity Fair magazine titled its recent 2010 survey of contemporary architecture, ‘In the Age of Frank Gehry’ in recognition of his impact. Gehry might be taken as a weather vane for our period. Accordingly, his work is of signal importance in reading our times being at once emblematic and a symptom of something deeper. What is special and different about his architecture? The most obvious point is Gehry’s close links with artists. He sees his work as foremost being an artist. Function is subordinate to artistic interests. Purpose, in this instance, a school of business studies for the UTS campus which seeks to stimulate creative imaginative thinking by its students, is secondary to the task of making large sculpture. Architecture is less about purpose and is mostly about art spelt with a capital ‘A’. Italians used the term maniera to mean ‘style’. Hence, mannerism, is about the promotion of style above all else, the creation of a special look in architecture. In today’s language it is about architectural branding. There is a Gehry brand, a special approach that makes his buildings different and instantly identified with his name in the same way we view the products of such luxury brand names as Louis Vuitton, Gucci, Prada, Giorgio Armarni, Hermès, and Chanel, must all be styled and emblazoned with a unique look. Architecture, for some time, has been part of fashion and like the clothes we wear, the buildings we work and live in speak for us and give us our identities. Students who study business at UTS will be different from those who graduate from other schools. This is the message UTS hopes the architecture will send to overseas fee paying students. It will be worth every cent because you will study in a Frank Gehry masterpiece. This is the way universities promote themselves overseas, through their architecture. Architecture is so visual, it offers the easiest most direct way to communicate what a university has to offer. Wasn’t it ancient Greece that showed how architecture and philosophy were happy bedfellows. Gehry’s design is part of the UTS vision. But it is a matter of debate whether these enlightened would-be Medicis have read Gehry’s language correctly and understand what it says. If they did understand, they might be more cautious and more than a little uneasy about its message. Let me explain what I mean: let us suppose that the architecture symbolizes the collapse of existing business structures, criticises the way capitalism is pushing the world towards catastrophe through its insistence on economic growth regardless of the environmental costs and its impact. It would it be ironical at the very least. How does this message of fiscal instability and crisis sit with the pedagogical purpose? Or, is Gehry simply making a joke about breaking eggs to make an omelet? The architectural symbolism of a monument expressing instability and crisis is confronting, even devastating. Gehry’s starchitect status is an essential part of the sought after image. UTS is buying a Gehry regardless of how Gehrysh it is. The important thing is the cachet the Gehry architectural brand imparts to the UTS client. In America, this is well understood and familiar. Education like perfume, handbags and clothing is just another segment of consumer culture and indication of social status and achievement. It requires superior taste and wealth to pay for a Frank Gehry building. A closer look at the design should give pause for thought. What is Gehry alluding to? Is the Dr Chau Chak Wing a coded reference to the World Trade Centre event? How tasteless and macabre. Or is Gehry saying something along the lines that time eventually destroys everything, every building we make will end eventually as a ruin. The Chau Chak Wing School of Business is a ruin at its inception. How is that for a mannerist conceit -- a building that anticipates its future fate as a ruin. 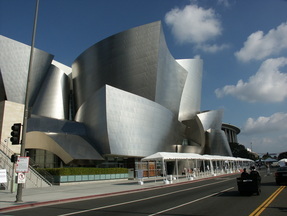 With the back rear elevation Gehry supplied his UTS clients with what they originally hoped for, a recognizable signature example in the Gehry manner, as exemplified by the Guggenheim Museum in Bilbao, 1997, or the Walt Disney Concert hall, Los Angeles, 2003. This is the look the clients no doubt expected. Instead, Gehry delivered a frozen wreck as it crashes to the ground. The parallel with Giulio Romano in Mantua with its play of dropped triglyths, invading rustication and debased classical orders is all too plainly self-evident. Like the Palazzo del Tè, Gehry’s UTS school of business has no structural unity. Even worse, there is no structural strength. This does not mean it will fall down. The twisted, distorted, passive, forms are indicative of instability, fragmentation and weakness, the very opposite of what is required. Instead of seeming to be centres of force that act on their surroundings, the frames are weak and crumpled, instead of depth, the outside is wrapped in sheets of material that are acted upon, forms are deformed by outside forces that distort them in arbitrary ways. It all seems like an accident. Architecture is the unconscious of society. It reveals our deepest unconscious anxieties, the shared spirit of the time, what was once called the zeitgeist. Do we not in 2011 share similar fears to Frederico, Duke of Mantua, and Giulio Romano in 1534? The message seems obvious, perhaps, too obvious! If many people draw back from expressly saying this from a fear of acknowledging the crisis, nothing prevents them from reacting instinctively to Gehry’s deeply disturbing architectural forms. The lack of insight by critics who appear generally uninformed about architectural history and Gehry’s incipient mannerism is less excusable. We are not the first generation to be caught in crisis and have our confidence shaken. Gehry captures this sense of confusion and mistrust of institutions by resorting to new versions of earlier mannerist gestures. His design for Broadway is almost Grotesque. The Grotesque is about the cultivation of ugliness as the antithesis of beauty. Like flipping a coin, ugliness is the opposite face of beauty. Strangely, ugliness is an aesthetic. This is the function of Victor Hugho’s hunchback, Quasimodo, in Notre-Dame of Paris. The hunchback is the living embodiment of the Grotesque in French Gothic architecture. When Hugo was writing in the 1830s, Gothic architecture was considered as ugly and inferior vis-à-vis French classicism. New styles are often perceived that way -- the Baroque originally meant irregularly shaped, grotesque, after a misshapen pearl. A generation after Giulio Romano, Andrea Palladio from Vicenza, made mannerism popular throughout Europe. 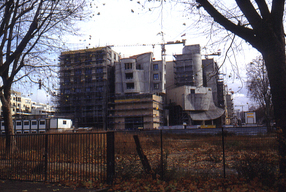 Frank Gehry is unlikely to repeat Palladio. In any case, the business school design for UTS is hardly new, traces of it are present in earlier works such as the American centre, Paris, 1994, and Nationale-Nederlanden Building,Prague, 1996. The presence of an aesthetic of anxiety and weakness in a building dedicated to Business where one would ordinarily expect ideas of strength, stability, balance, even dynamism, to dominate is both surprising and odd. In the past it was accepted, standard practice, that banks, financial institutions and corporate HQ should appear strong and unassailable to gain our trust. The Gehry style at Ultimo is too disconcerting, too disturbing, and too pessimistic. More to the point—it is too expensive. But expense has never been an obstacle in the pursuit of exclusivity. In the world of luxe fashion goods, some would say, it is its most desirable feature. See also: Video - "UTS CAMPUS MASTER PLAN"